Goodreads Summary: It’s been a decade since the Delongpre family vanished near Bayou Rabineaux, and still no one can explain the events of that dark and sweltering night. No one except Niquette Delongpre, the survivor who ran away from the mangled stretch of guardrail on Highway 22 where the impossible occurred…and kept on running. Who left behind her best friends, Ben and Anthem, to save them from her newfound capacity for destruction…and who alone knows the source of her very bizarre—and very deadly—abilities: an isolated strip of swampland called Elysium. I have pretty mixed feelings about The Heavens Rise. I was expecting something super-creepy and mysterious, and while there is a mystery and a sense of creepiness at the beginning, it also didn’t have the super-creepy mystery I was expecting. It was creepy and mysterious at the beginning, but unfortunately, the unraveling mystery didn’t do much for me. And the creepiness of Marshall and what was going on was really creepy at the beginning, because you don’t know what’s going on. But as you figure everything out, the creepiness factor got a little lost. I did like how Nikki’s journal entries were scattered throughout the book, and how her story connected with Marshall’s and Ben’s story. The novel also jumps between past and present, and the different perspectives and times worked better than I was expecting. You get such a clear picture of the different elements and how they all come together. Still, it did make the book feel like it was all over the place at times. 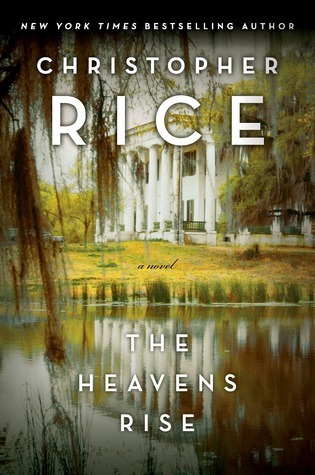 New Orleans is the setting for The Heavens Rise, and while it seems like Rice really knows the city (as he apparently grew up there), it didn’t completely work as a setting for me. I mean, the swamps and stuff lend to the parasite and everything, but I think I was expecting more of the creepy side of New Orleans. It seems like it would lend itself to paranormal creatures/humans that are a result of a parasite in the water, and while we get a little of it, I think I was slightly disappointed that we didn’t see more of it. I don’t have strong feelings for any of the characters, but Nikki was easily one of the more interesting characters, as was Marshall. Marshall, because of his obsession with Nikki and Nikki, because we get to know her through her journal entries and through the memories of Ben. I think part of why she’s so interesting is that we slowly get to know Nikki over the course of the book. I do wish we knew more about Nikki and her family. I did like The Heavens Rise, and thought the overall premise to be really interesting. I liked how the paranormal elements blended so well with the “real” world, and I wish we got more of those elements. The character didn’t particularly stand out but there were a couple that were a little more interesting than the rest. The Heavens Rise get 3 stars.